UMASH traveled over the river into Wisconsin for Ag Safety Day 2018 at the Wisconsin Indianhead Technical College (WITC) – New Richmond Campus. We were invited to present and attend by Wisconsin OSHA. This event was sponsored by OSHA, WITC and Compeer Financial to provide valuable safety information plus networking for dairy farmers, agriculture students and those working in the agriculture industry. 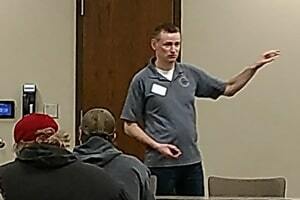 Dr. Gerard Cramer – dairy faculty from the University of Minnesota and UMASH presented a session titled “Stress Less with Good Cattle Handling – Reducing Worker Injuries”. He engaged the group of 50 to think about the cow’s perspective and reinforced the PALS concept: Be PATIENT; Consider the ANGLE of your approach; Think about your LOCATION in relation to the cow; Slow the SPEED of your movements. Carol Peterson interacted with attendees and provided information on our dairy resources including animal handling barn posters; needlestick prevention posters; DVD’s and additional UMASH resources including the U.S. Agricultural Safety and Health Centers YouTube channel. This event was an excellent opportunity to meet faculty and staff at WITC and share our common goal – to improve agriculture safety and health. We plan to make more trips over the river to collaborate with our agriculture safety and health colleagues in Wisconsin.